If you’ve ever visited the West of Ireland, you probably are not surprised that it is the home of many love stories. The untamed Atlantic and rugged coastline are a perfect match for the feeling of being head over heels in love when your heart rules and you are engulfed in the enormity of your emotions. Sipping a cocktail on a tranquil sunny beach is very pleasant, no doubt, but the West of Ireland is more passionate than pleasant – and isn’t that passion what’s so amazing about love? It’s not a coincidence that so many romantic Irish gifts and stories have a link to the West specifically. The scenery along the Atlantic coast is stunning. Galway Bay, the Cliffs of Moher, the Burren and countless little spots from Kerry to Donegal offer dramatic beauty and a sense of wildness. Very few days provide an opportunity to lounge in the sun, but it is far more romantic to cozy up in front of a roaring turf fire after a stroll viewing the crashing waves pounding the towering cliffs. The classic movie The Quiet Man starring Maureen O’Hara and John Wayne was set in Mayo, which is in the West. In the love triangle legend The Pursuit of Grainne and Diarmuid, the young lovers escape leaving the older man Grainne was supposed to marry in the lurch and go on the run before settling in Sligo and having five children. Perhaps the most famous real life love story from the West of Ireland is the one behind the design of the iconic Claddagh ring. Richard Joyce was a fisherman from the Claddagh village in Galway. One day, he was captured at sea and sold into indentured servitude. His sweetheart back in Galway had no way to know if he would ever return to her, but she remained faithful. Eventually, Joyce did earn his freedom after serving a period of time with a goldsmith. He’d learned the craft, and in the process he created the beloved heart, hands and crown design that features on so many Irish gifts today. He returned to Galway, and he and his beloved were married. The Claddagh design, which symbolizes love, loyalty and friendship, on any type of jewelry makes for one of the most romantic Irish gifts, and Connemara marble is another symbol of the romantic West. This elegant green and grey stone can be worked into many items, including jewelry, to call to mind the West’s dazzling landscapes and seascapes. 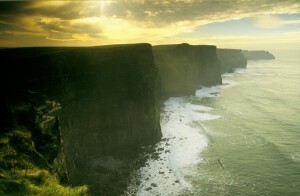 Of course, the West of Ireland is also a famous place to look for love. The tiny town of Lisdoonvarna in County Clare normally has a population of less than 1,000 people. But every September the wee village is home base for the tens of thousands of fun-loving, love-seeking singletons who flock to the annual matchmaking fair held there. Old and young, gay and straight, rural and urban, Irish and visitors flock to the West of Ireland in search of romance, the best of all the Irish gifts you can find.